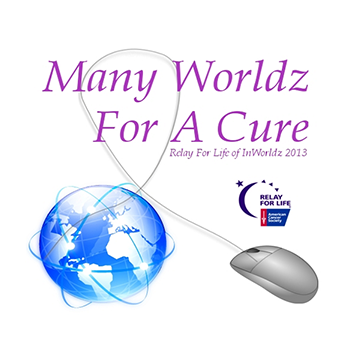 The Second annual Relay for Life of InWorldz (RFL of IW) season has been formally announced. InWorldz held its first Relay For Life (RFL) season, fully sanctioned by the American Cancer Society, in 2012, raising some $15,000. The 2013 season will commence in late August 2013 and run through until the start of November, culminating in the Relay itself on Saturday November 2nd. The season opens on Saturday August 24th, 2013 at 09:00 InWorldz Time at Paradise by Design (IWurl). The “half way” event will take place on Saturday September 28th, starting at 09:00 InWorldz time. The Relay itself will be held on Saturday November 2nd, commencing at midday, InWorldz time. Sponsorships for the season are currently open, and comprise three levels, starting at $50.00 USD and rising to $150.00, each with unique benefits to sponsors, including website promotion, event mentions, logo promotions, and more. For full details of each level of sponsorship, the levels still available, and how to become a sponsor, please refer to the RFL of IW sponsorship page.